Thredbo is widely regarded as Australia's best ski resort. It has Australia's biggest vertical drop of 672 metres (1365m - 2037m), tree runs as well as open areas, and a true alpine village. Thredbo also boasts the biggest snowmaking system in the Southern Hemisphere (other resort's snowmaking is trivial by comparison), they can even open vast areas with no natural snowfall at all (ie: 2km long runs). Despite only having 14 lifts, they are far longer and faster than at other ski resorts, so the real uphill lifting capacity is the best in the country. Queues are shorter here than at other resorts - you spend more time on the slopes and less time in queues and in lines. Thredbo Village has over 5,000 commercial beds but it is a small place - if you are wearing shoes you can walk from the centre (or the slopes) to the furthest point in about 4-5 minutes, but there is a free shuttle bus system (they run in circles every 5 minutes or so) so you do not have to walk far when carrying your equipment and wearing your ski/board boots. You may have a friend or two telling you that one resort is just better than the other, but the truth is this: People often get into never-ending arguments over one resort being better than the other. If you were to assemble 20 skiers & snowboarders and ask then which resort is better, you will get half saying Thredbo and half saying Perisher. Then they will start to argue passionately with each other in front of you. If your friends have given you stern advice to go to one ski resort it just means they are on that side of the fence, go ask other people and you will get another answer. Think of it as like asking your friends which football team is best. Note the 2 ski-lift companies are also fierce rivals. The advice below is designed to give you some pointers. If you buy your lift or lift+lesson passes (at normal retail prices) in the ski resort then the 2 resorts are about the same price. But with Ski Kaos, about 90% of our customers chose Thredbo. Because we are wholesalers for Thredbo we offer better prices and packages there. We still take bookings for Perisher, but our lower Thredbo prices are enough to convince even die hard Perisher fans to ski or snowboard at Thredbo. In addition Ski Kaos' buses travel to Thredbo, so if you want to get to Perisher you need to catch the skitube from Bullocks Flats (13km before Thredbo). This makes Perisher even less attractive because skitube is an expensive add-on to Perisher's lift pass price (read the "Advice for Aussie Snow Holidays" section for more info on this). Perisher markets itself as "Australia's Super Resort", laying claim to being the largest resort in Australia. It offers the best terrain for beginners and intermediates. 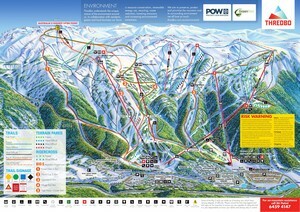 The sheer number and variety of trails and ski lifts will keep you happy for many days on end. The 50 lifts are everywhere so you can choose a run you like & ski it all day, or try a new lift every time. The resort covers a big area with lots of variety - there are many disadvantages with Perisher but these are huge advantages. Perisher has better beginners terrain overall, but it is more crowded and confusing. By and large, the choice for most beginners comes down to price and Thredbo is far better value. Thredbo has less beginners areas but still has plenty - tens of thousands of beginners come to Thredbo each year to learn to ski. Lift lines at Perisher can be extremely long on weekends and during the NSW July school holidays, but Thredbo runs very smoothly. Contrary to popular beliefs, August's weekends are actually the busiest times of the season(everywhere), more so than the school holidays. Thredbo markets itself as a "World Class Ski Resort". Their major advantage is the vertical rise: 672m vs. 314m at Perisher. This is a massive difference as it means most ski runs are about 215% longer. Ski resorts world-wide usually boast their vertical rise, not the number of lifts! For example, the best lift-accessed skiing in the world is indisputably at "Les Grands Montets" in Chamonix, France; it has a mere 9 ski-lifts, but a whopping 2,039 meters of vertical! 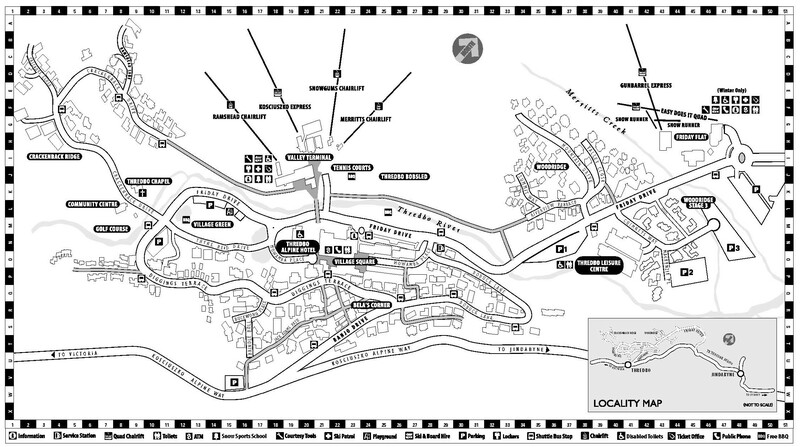 Thredbo's facilities are World-Class: the 14 ski-lifts include 3 high speed quad chairs which compare to Perisher's T-bars like freeways compare to back roads. Despite only 14 lifts to Perisher's 50, in real terms Thredbo has a much higher capacity lift system. School holiday crowds are merely "noticeable" at Thredbo, whereas Perisher can get long queues. Thredbo's expert terrain is by far Australia's best; there are lots of 'hidden' areas, and good intermediate 'cruising' runs. Perisher's expert terrain is not as good, boasting only "Olympic T-Bar", rarely open and even then only 100 meters on the steep section. Most snowboarders much prefer long runs and fast chairlifts. 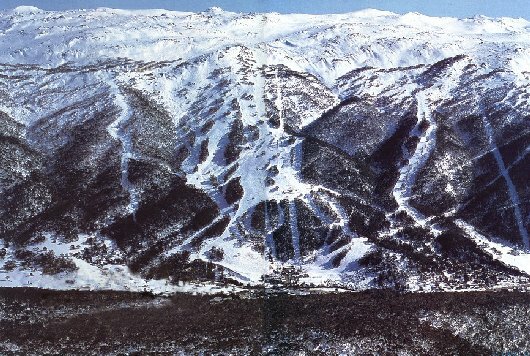 Because of this Thredbo is more popular with snowboarders. Often the snow is thin at the bottom of the mountain, making the last quarter of some ski runs less enjoyable, but Thredbo have set up the largest snowmaking in the Southern Hemisphere to tackle this. Over the past 3 years this system has been massively upgraded - Thredbo can now open vast areas with no natural snowfall at all (temperatures permitting); in 2008 the snow came very late:- Fri July 4th had seen no natural snowfall at all but Thredbo had two 2km runs open (High Noon & Supertrail from Snowgums); each run 50 - 150 meters wide with an 80cm snow depth! Thredbo has many off-slope advantages: buses park only 120m from the ski-lifts; there is overnight parking, there's no stuffing about with skitube; cars & buses rarely need to fit snow chains; the road has less traffic jams; lunch prices are cheaper, there's a real village with interesting shops, things operate more smoothly, there's less hustle & bustle, and it isn't too filled with families but still manages to be family friendly.